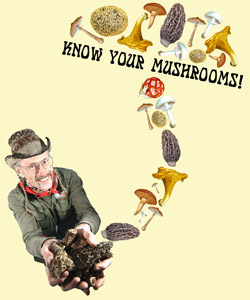 Have been trying to find a way to ask a question of mushroom enthusiasts on this site, but haven’t found a way. Hope this does the trick. In 2009 there were so many king boletes in my area that I left behind many to make sure that they would be there this year. NONE grew this year despite lots of rain. Are these bi-annual? Have found no info about this. Thank you for your response Gerry! I did not find as many Kings this year as we did last year. Last year was an unusually good year for Boletes. I have not read anywhere that Boletes are bi-annual. We usually find them in the same places year after year. Maybe they produced so much fruit in 2009, that they needed to rest this year. We had a very wet and cold spring that did not help some types of mushrooms produce. Did anything besides weather change in your area this year?